EN // Boomdabash is one of the best raggae bands in Italy. Originally from Salento, they were born in 2002 as a classic jamaican sound system, founded by Blazon, the current deejay and producer of the quartet. Progressively Boomdabash change connotations along a path of artistic evolution that leads to the realization of the first official work, “UNO” (2008). Of the original sound system now there is little left and the Boomdabash soon become a full-fledged band. Blazon, Biggie Bash and Payà (the two singers) together with Mr. Ketra, talented Abruzzese beatmaker, actively and more consciously start their adventure in reggae music. The debut album receives feedback as big as it is unexpected. The project is striking for the freshness of style, the innovative way of looking at reggae, the sought after productions and the choice to express and communicate using two languages at the same time: the Jamaican patois and the Salento dialect. All this consecrates these four young guys of the south as one of the most solid and appreciated band of the peninsula and, over the years, the Boomdabash are appreciated for their musical flexibility, attention to the social and the ability to innovate and renew themselves. In May 2011, three years after the successful release of the first work, the Boomdabash publish the second recording project, “MADE IN ITALY”, anticipated by the hit track “MURDER” that brings the band to the victory of the MTV New Generation on stage MTV Days in Turin. After this great achievement, the Boomdabash begins a two-year journey: a tour that crosses Italy from the north to the south with over 100 dates. “Made in Italy” thus becomes the most representative product of the Salento reggae band, as born from their process of maturation and artistic growth. The album is loaded with the most varied musical influences but, despite its heterogeneity, it maintains an unmistakable reggae aroma. In June 2012 another national success “DANGER” enters the radio show, which in a very short time becomes one of the most successful tune of the summer. The experience of life, however, arrives in October 2012 with the Hitweek Festival. 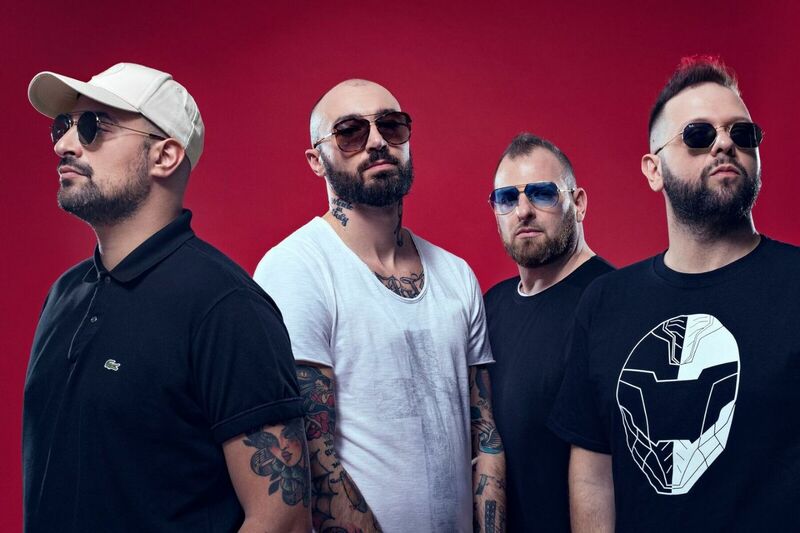 The Boomdabash, in fact, are chosen together with some big names in Italian music such as Subsonica and Negrita to represent Italy on a tour that touches the United States, in particular New York and Miami. This experience becomes the opportunity to export their very special sound in America, in fact the song “Danger” soon enters the rotation on MTV Iggy and in several radios of Florida. Back in Italy the Boomdabash publish the single “THE MESSAGE” whose street video is filmed between Manhattan and Brooklyn together with Dj Double S, one of the pillars of Italian rap music. The song “The Message” is the first single of the long awaited third album, “SUPERHEROES” (2013), which enters since the first day in the Top ten of the best selling albums of iTunes Italia. “Superheroes” is a mature, complete and innovative record that winks not only to reggae but to all the music, with many Italian guests who embellish the 13 tracks making them part of a small masterpiece. In 2013, from this latest recording project, three other singles are drawn: in May “SUNSHINE REGGAE”, in July “REALITY SHOW” which sees the collaboration of the Sud Sound System and in November “SOMEBODY TO LOVE”. The “SUPERHEROES TOUR”, which accompanied this record release, saw the Boomdabash perform in over 50 concerts in 10 months, recording numerous soldouts throughout Italy. In June 2014 the Boomdabash present their new single, “THE IMPORTANT” which sees the participation of the historic Roman group “Otto Ohm” entering immediately in the top ten of the general ranking of ITunes Italy and remaining firm in the first position of the reggae standings from the same store for more than six months. Also in the month of June 2014 the band starts with the new summer tour, the “MAMMALACAPU SUMMER TOUR” which sees them engaged in 24 repetitions of the show around Italy counting a presence of stunning audience, touching tips of 10,000 people to show . Even the winter tour called precisely “WINTER TOUR” between December 2014 and January 2015 is a hit. All the dates, from the one to the historic Alcatraz of Milan to that of the Mamamia of Senigallia see the surprising presence of an audience now very attached to the Band. 2015 was a year full of news for the training of Salento that begins with a bang, presenting its new single “UN ATTIMO”, ambitious project accompanied by a video clip directed by Mauro Russo and his team of productions “Calibro Nove”. The video in question has been entirely shot in the Borgo S.Nicola district of Lecce and almost all the actors are Held, guests of the structure itself. The single “Un attimo” had the function of marking the opening of a new cycle of Boomdabash, which culminated Tuesday, May 19, 2015 with the publication of the new single “Il Sole ancora” Feat. The BlueBeaters. The single in question available in all online stores is accompanied by a video clip directed by Luca Tartaglia in the streets of Vigevano. On June 10th 2015, the fourth album of the band entitled “Radio Revolution” was released. This new record is currently the highest point of the Salentino quartet’s career and it is also evident only by reading the tracklist of the album that includes artists such as Alessandra Amoroso and J-ax in addition to the aforementioned BlueBeaters. Two weeks after this new release, the Boomdabash begin their summer tour full of soldout important appearances in the top Italian music scene and on the most prestigious stages such as that of Postepay Rock in Rome, opening the legend of the world reggae Damian Marley. At the end of the Summer Tour, in September 2015 the band launches the third single extracted from “Radio Revolution” proposing to the public the Featuring with J-ax entitled “Il Solito Italiano”. This new release accompanies the band for the whole winter tour and until the release of the new single “Take me with you” that immediately was a great success reaching the 14 million views on youtube with the video directed by Mauro Russo and with the participation of Gianluca Di Gennaro, talented actor also present in Gomorra La Serie. The Portami in Tour that accompanied this record release was an unprecedented success, also touching the 25,000 spectators for some concerts that will remain in the group’s history. Archived the tour, the surprises do not wait and between September 2016 and early 2017 the band collects the fruits of hard work done reaching the ambitious goal of Fimi certification as a gold record for three tracks. The first to arrive is the one for “A tre passi da Te” Feat. Alessandra Amoroso, the second is for “The important” Feat. Otto Ohm “while the third one is the one for” Take me with you “that in the following months will reach the most coveted milestone for a band’s career. The Fimi certification for the Platinum record. These achievements are a great success for the band and for Soulmatical, the independent label that has been following the project since its inception. Meanwhile the Boomdabash take part in the Italian tour of two sacred monsters of the world reggae Alborosie and Gentleman playing in the best Italian clubs. In June 2017 the single “In un giorno Qualsiasi “ comes out, a song with which the band arrives In Universal Music and in the same year they receive the platinum record for the hit “Portami con te” by participating in the Wind Music awards. In June 2018 it was released “Barracuda” their last album that has conquered every ranking. The single “Non ti dico no” was the most widely transmitted song on Italian radio, at number 1 for eight weeks, making it the most played song for the whole summer. After winning the Rtl 102.5 power hits summer and the Earone award at the Wind Music Summer festival and following the great success of the major Italian cities with their barracuda Summer tour that has sold out everywhere, the band is preparing to conquer the Europe with new live dates before facing a new winter live tour in Italy.